In October of 2006 I found myself in Los Angeles at the home of an old high school teacher I’d kept in touch with over the years. I was in town to do a reading at Tía Chucha’s Centro Cultural and Bookstore. I’d recently entered into contact with someone I’d yet to meet but whose work as an editor/publisher I was a big fan of. I’m speaking of PALABRA’s elena minor. She graciously offered to pick me up and drive me to the reading. It was a fortuitous meeting. Afterwards we went out to dinner, and were joined by poets William Archila and Lori Bedikian. It was a night of new connections, new relationships. Shortly thereafter, Letras Latinas Blog published an interview with her. 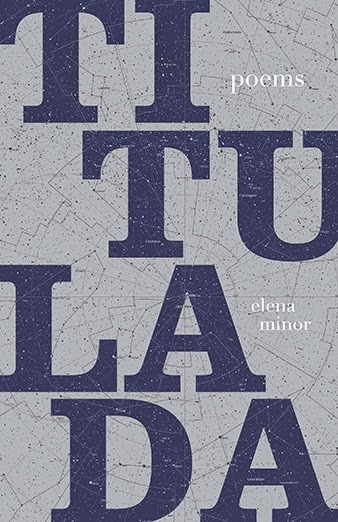 Fast forward eight years: elena minor’s TITULADA has been released. Letras Latinas is proud to have had a hand in ushering this vital work into world: TITULADA is the second installment of Noemi Press’ AKRILICA series, a co-publishing venture with Letras Latinas. ils: I have to confess—I’m not always the best reader of experimental poetry as some of it leaves me cold—but there’s something very physical, very embodied about your language, its inventiveness and its interactions with blank space. It moves across the page with a control edged with recklessness. The words and thoughts leap and twist, run and flip, kick and two-step. I hear it in different registers—shouting, whispering, songlike and precise, barely audible and loud to the point of approaching incomprehension. How do you approach language and meaning in your work? What do you think spurs the leap in understanding between the poet and the reader in experimental work? em: I don’t think of my work as ‘experimental’. The word implies a theoretical framework that is not my starting point. That said, though, I do consider my work “exploratory” because that’s what I do with language - explore its possibilities – mostly in a never-ending attempt to explain the why of the world to myself. I start wherever and however the feeling, notion, idea starts and let that carry the weight of words, form and sound. I love sound in poetry, especially rhythm and cadence. Sometimes I let them carry the poem to the point where they are as much the sense as the form of the poem. I also don’t always know the ‘meaning’ of my work. I just know there’s something I need to say, and I let that drive what I put on paper. It’s not always necessary to ‘get’ a poem on the first read. If it takes a poet weeks, months, even years, to write a poem, why should it take only a few minutes to understand it in its fullness? Not getting it right away is a reason to go back and reread it. It sometimes takes me years before I get the full sense of a given poem. Often it comes when I’m no longer trying to understand it – when I just let the collection of words, sounds and symbols overtake me. ils: Could you share with us a bit of your path as a poet? Which poets and experiences influenced and influence you? em: There’s no real path. I simply started writing in my early teens when I discovered I enjoyed it. I got a couple of pieces published in my high school literary magazine, but I didn’t think of myself as a writer for many, many years. Other endeavors – more action than thought - always seemed more important. Thinking of myself as a writer was a long time coming. I finally reached a point where I realized it was now or never – let’s see what you got, esa. So I got serious about it. I threw away everything I’d written until then and started all over again. My first publications were fiction work, though. The poetry was still too inchoate to send out for publication. Then at some point poetry became dominant in my writing. Still, it took about eight years to get to TITULADA. There are poets whose work I like or admire but no one person or singular event have influenced my work – at least not consciously. I often smile, though, when my work is compared to that of a poet whose work I’ve never read. Certainly, though, my work is not apart from the world I live in, and my cultural roots are in activism. I am one and many – who I come from and who will follow. And there are wrongs in the world and they must be dealt with. I’m also a believer in organic writing. Put on paper what wells up from the gut. Your tripas don’t lie. What is disembodied becomes em-bodied— “…some sounds are simply meant to be born. As the chanting/ begins itself she rewinds herself, beguiled by the rhythm—syncopation of an old rattle/beating new time. The body curves languidly into its dance as around her the ancients/happen in place and choose partners” –which feels as if is about a space that is claimed because of the way it is described and by being described it is also being invented. And so, it left me feeling that titulada invoked the idea of Speaker as Creator, of a feminine God creating not a man, but a woman to give titles/names to the world. em: Yes, it’s all of those and more – a sense of discovery and affirmative presence in the universe from before time until after time. It’s also about the ‘called’, with undertones of beckoning, anointed, essential. The title actually came late in the development of the poem, but when it came time to title the book, sin pensar it seemed the right choice. ils: TITULADA constantly surprised me because while it speaks of the border and southwest/barrio/Chican@-associated imagery, it always does so in startlingly different ways than readers would ever anticipate. Specifically, in poems like “STILTS IN CHICANOLANDIA,” “WATER DOWN,” or “LOW AND SLOW TO TASTE”. How do you see your role as a poet and as a Chicana/Latina to the border and to the literature of the border? em: I haven’t spent much time in geographic border areas - a week in Caléxico/Mexicali, a few trips through Tijuana, a memorable, invigorating week of política in El Paso/Juárez way back when. My own extended family regularly crossed Southwest borders before they finally settled in the U. S. But borders are everywhere, externally and internally imposed, and I find the idea of borders stimulating literary fodder. When does a border define what is ‘inside’ versus what’s ‘outside’ and how does that play out in how we take action? Sometimes I think we bring our borders with us, whatever and wherever they are. But also, ‘border states’ in all their meanings are sources of innovation and creativity. Things happen at borders that don’t happen anywhere else. Or maybe it’s simply because I hear so much ‘I can’t’ that I’m driven to ‘I can’. Cross every border I can. My ‘yes’ to every ‘no’. ils: There’s an apocalyptic tendency in the book—this desire to start with the end of the world, the world ‘erased’ and then to bring it into being. From “APELLIDO”: “…to ruin with lost grains and gutted ancestry. There/ will arrive no last recovery, only a solo act of última[te] memoria[l], strong willed/morsel of solace that scratches sand from bone, then moves on to pitiful dénoument.” Certainly “LOOSED ENDS” and “ON THIS DAY” also share that tendency. Where does that impulse come from? In some ways, it feels as if it’s what fuels the book. em: I’m fascinated with astronomy - the vastness of the universe, how much we don’t know about it and our place in the never-ending. It’s a place & time of endless ending and beginning. I’m constantly trying to wrap my head around the mere idea of the universe and what it means in the here and now. We are who we’ve been. Or are we who we will be? em: I wish I had a succinct answer to those questions. Everything comes from both languages – and others (Italian, French, Portuguese, Latin and even a smattering of Russian). I use words in whatever language they arrive. Some thoughts, feelings, notions seem more right in a language other than English – or even Spanish. It’s not a conscious thing. ils: You’ve been the editor/founder of PALABRA: A Magazine of Chicano & Latino Literary Art since it began publication in 2006. What inspired you to start a Latino/Chicano-focused magazine and what has kept you going since then? What do you see as the role of publications like PALABRA in our communities? em: I started PALABRA because I didn’t see anyone publishing Latin@ literature that wasn’t geared to an Anglo audience or that was little more than an apologia. What I wanted PALABRA to do was break through others’ and our own expectations of how Latin@ lit should speak [up]. I wanted work that was organic, fresh, original and unbound. I’m not sure I’ve succeeded but at least now there exist several publications that specifically seek out work by Latin@s and other peoples of color. But it’s still only a handful. There should be many more – dozens - and there should be a diversity of aesthetic, style, approach and genre. We should have litmags devoted to narrative poetry, prose poetry, experimental/innovative poetry, metric poetry, short fiction, short short fiction, memoir, hybrid, cross genre, literary sci-fi, etc. More is better. The more we publish our own literature, the more our own communities will see it as a given – the natural expression of who we are. It will out. I know that for some writers acceptance/validation of our literature by the larger [Anglo] literary community is paramount, but if that’s the primary goal then how does that influence our work? We need to go beyond the narrow parameters they have set for us. ils: What are you working on now? As a writer? As an editor? em: I’m not doing much as an editor at the moment. Taking a hiatus to focus on my own work. For the last year or two or three I’ve been working on an oddball collection of short prose and a cross genre book of desperation writing that sorely need my attention before they die of neglect. A second volume of poetry is probably a ways away. elena minor is the author of TITULADA (Noemi Press, 2014). Her poetry and prose have been published in more than two dozen literary journals, including Jacket2, MAKE, Hot Metal Bridge, RHINO, Puerto del Sol, Switchback, Mandorla and Shadowbox. She is a past first prize recipient of the Chicano/Latino Literary Prize and founding editor of PALABRA. She also teaches creative writing to high school students. A native of the San Francisco Bay Area, she currently resides in Los Angeles. 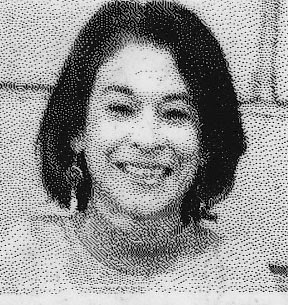 ire’ne lara silva lives in Austin, TX, and is the author of furia (poetry, Mouthfeel Press, 2010) which received an Honorable Mention for the 2011 International Latino Book Award and flesh to bone (short stories, Aunt Lute Books, 2013) which won the 2014 Premio Aztlan, placed 2nd for the 2014 NACCS Tejas Foco Award for Fiction, and has been shortlisted for Foreward Review’s Book of the Year Award in Multicultural Fiction. ire’ne was the Fiction Finalist for AROHO’s 2013 Gift of Freedom Award, the 2008 recipient of the Gloria Anzaldua Milagro Award, a Macondo Workshop member, and a CantoMundo Inaugural Fellow. She and Moises S. L. Lara are currently co-coordinators for the Flor De Nopal Literary Festival.